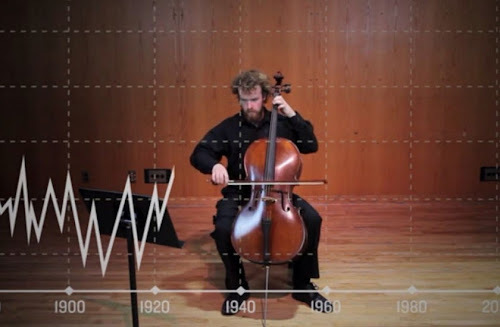 University of Minnesota student Daniel Crawford (IMAGE ABOVE) plays temperature readings over the past 130 years as a solo composition for cello entitled “Song of Our Warming Planet" (VIDEO HERE). Editor and communications director Todd Reubold describes, "The result is a haunting sequence that traces the warming of our planet year by year since the late 19th century. During a run of cold years between the late 1800s and early 20th century, the cello is pushed towards the lower limit of its range. The piece moves into the mid-register to track the modest warming that occurred during the 1940s. As the sequence approaches the present, the cello reaches higher and higher notes, reflecting the string of warm years in the 1990s and 2000s." Energy technologist S. Julio Friedmann and computer programmer Michael Loomis of Lawrence Livermore National Laboratory produced a composition for digital violin called "Fiddling a Warming Tune" that charts more than 600 years of climate variations (VIDEO HERE, SCROLL DOWN). Friedmann explains, "I had a number of reasons for doing this. Chief was that I found that many people simply didn’t understand — internally, viscerally — the relative timing, magnitude, and rates of the climate changes. A scientist can look at the graphs and get it, but most people won’t intuitively understand. Among other things, this leads to confusion about what’s a natural cycle versus an unusual, indeed unique, detour away from natural signals. Sound was a new way to communicate this – orthogonal, and compelling."